The majority of galaxies in the Universe, including our own, are found within groups. The study of groups and their galaxies is a special interest of the group at Birmingham. 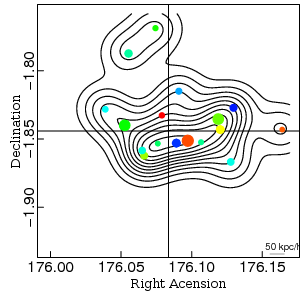 We carry out multiwavelength observations of the group galaxies, X-ray observations of the hot intergalactic gas and radio observations of AGN activity which is found at the centres of some groups. This observational work is linked to cosmological simulations of group formation and evolution, allowing a direct comparison with the theory of cosmic structure formation. Groups may contain most of baryonic mass of the Universe. Since most galaxies are found in groups, the effects of the group environment is essential to an understanding of galaxy evolution. The effects of energetic phenomena within galaxies, such as starbursts and jets from supermassive black holes, can have a noticeable impact on the hot intergalactic medium within groups. As a result, the properties of groups provide a probe of galactic history and `cosmic feedback'. CLoGS - is a survey of groups in the Local Volume. This is generating a census of the X-ray, optical and radio properties of 52 optically-selected groups within 80 Mpc. GAMA - is a deep galaxy redshift survey being conducted with the AAOmega multi-object spectrograph on the Anglo-Australian Telescope. One of the main aims of the survey is to compile a catalogue of over 20,000 galaxy groups extending to z~0.5. We are leading a programme to obtain X-ray observations with the Chandra Observatory, and to link these to the multiwavelength data available for the group galaxies, to study feedback and galaxy evolution in groups. XI - this project involves an intensive study of a sample of 25 groups at the same redshift (z=0.06) selected from the 2dF redshift survey, using optical, infrared, ultraviolet and X-ray data to study the relationship between group and galaxy properties. XXL - we are playing a number of key roles within this large X-ray group/cluster survey, being conducted with the XMM-Newton Observatory. In addition to coordinating the measurement of cluster masses we are studying the properties of X-ray selected groups at z~0.4, and will be able to compare X-ray and X-ray selected groups in the 20 deg^2 overlap region between XXL and the GAMA survey. Chandra Deep Group Survey - in order to study the evolution in the properties of the hot gas in groups to the highest possible redshift, we have analysed the longest Chandra archival observations available, and have detected over 70 groups extending to redshifts > 1.